Did you hear that Shimmerz Siren calling out to you? Yep, that was me, Joyce, calling out to you to share some Sweet Magic Tea today. I made this canvas for my young niece to hang in her bedroom. She adores the color of pink and pink tea too. Ok now, grab a cuppa tea, make yourself comfortable, because I have a long post to share with you today. · A pink-a-licious 8 x 10 canvas background with pretty Shimmerz Paint colors of neutrals, pink, and similar colors found in magazine collage work. · A faux encaustic look created with Pasteez, Salt of the Earth, dimensional paint on the photograph of the child which rendered this cool milky transparency with an ethereal effect. This faux encaustic technique is so exciting, and I can’t wait for you to try it too. 1. 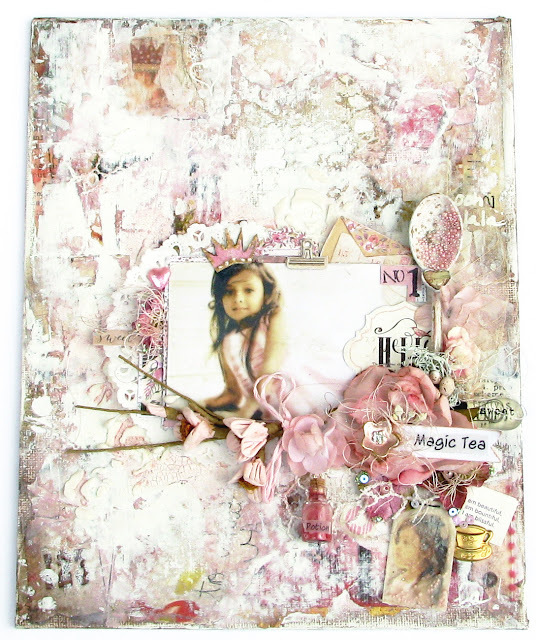 After torn collage work was affixed to the canvas using various magazine and textured papers, I mixed up a concoction of Shimmerz Paints Acritonez red and gesso to achieve the desired pink color. 2. I randomly applied the pink paint softly around the edges of the torn pieces of papers. Doing this melds the collage papers together so that it almost appears as if all those torn pieces become one. 3. I repeated the melding process randomly using, Aqua Huez, Cuppa Joe (no longer available at the store), and Inklingz, Penny 4 Your Thoughts. 4. Both the pink and brown paints were randomly applied to the edge of the canvas along with some Inklingz, Brass Knuckles. 5. A watered down gesso application was applied all over the canvas to unify the patterns of the papers and paint applications. 6. When the watered down gesso was dried, I applied thick coats of gesso and white crackle with a spatula to small areas on the canvas. After those products dried, I lighted sanded the thick coats of gesso and white crackle to smooth the finish. The photo of the child reveals an ethereal and milky transparency effect without using the traditional encaustic technique of hot melted wax. I have to admit that I prefer the results from Pasteez on a photo better than the real encaustic technique, because I can control how much of the milky appearance I want by limiting the number of applications of Pasteez without the hassle of melting the was…not to mention the time and clean up entailed using hot melted wax. 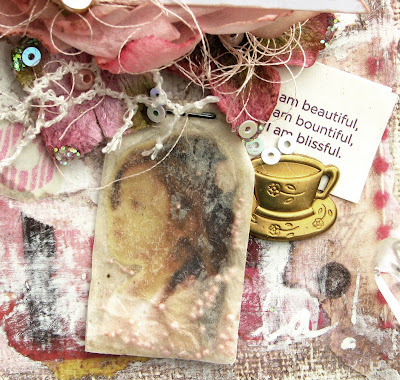 The faux encaustic technique was achieved by using Shimmerz Pasteez Salt of the Earth. 1. Using an ink jet printer, print photo on regular printer paper and let the ink dry thoroughly. 2. Apply a few thin coats of Shimmerz Pasteez on top of the ink-jet printed photo. Let each coat dry naturally before applying the next coat of product. Do not use a heat gun as it will render a bumpy appearance. 3. 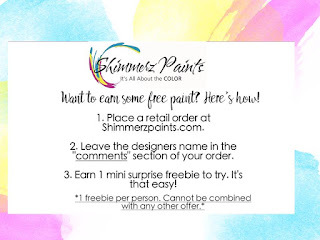 The ink printed on regular printer paper does not bleed with this Shimmerz product. How cool is that?! 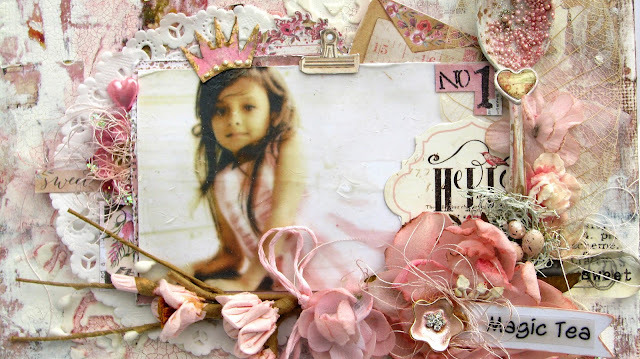 Think of the possibilities using this technique on some vintage pictures in your art work too! 4. After the product dried, I cut and glued the photo on top of cardstock and placed it on my canvas so that I could tuck in some layered embellishments. 1. Remove staple from tea bag and empty the contents of a tea bag (I have used Yogi tea bags because they have some sweet affirmations printed on their tea tags). Note: I have cut the tea bag down to my desired size to fit in with the scale of the composition. 2. 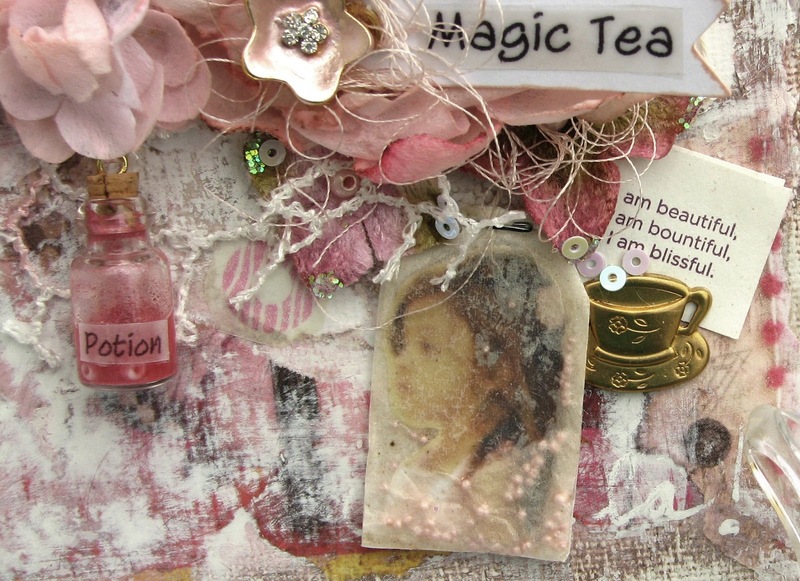 Insert some micro beads, glitter at the bottom of the tea bag and insert ethereal milky image as instructed under Faux Encaustic above. 3. Lightly apply a mat gel medium over the tea bag with the inserted photo and micro beads. This binds everything together. Bottle of Potion: Some Bed of Roses Spritz, clear glue, and beads were poured into the potion bottle. Tea Spoon: Gesso a small plastic cocktail spoon, mix Acritonez Red and Tuttie Fruitti Dimensional paint (to look like frosting in the bed of the spoon), add micro beads for sprinkles. 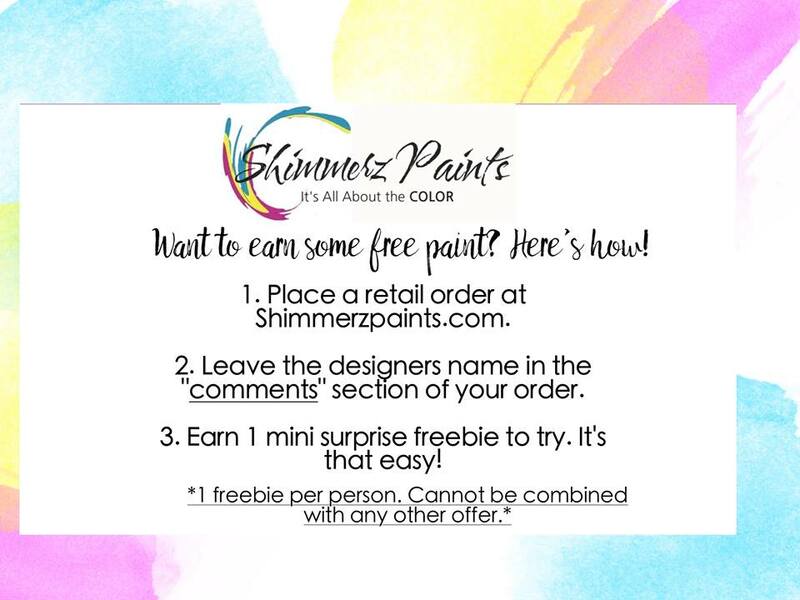 I hope I have inspired you to use Shimmerz Paint products outside of the norm and create your own Sweet Magic. Listen for my Shimmerz Siren to bring you back here on April 15th! Beautiful, with some innovative touches. So artistically beautiful! Lots of inspiration thank you. Wow...Ethereal...Gorgeous!I am inspired to try this technique. Thank you for the beautiful inspiration Joyce!! Love all the crazy cool techniques you have going on here, what an innovative way to use Pasteez, love that soft dreamy look. 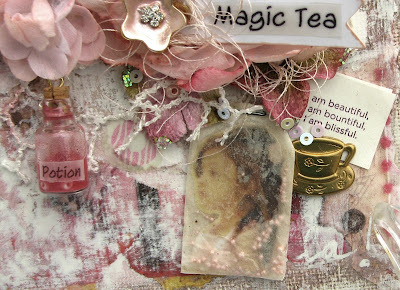 All the pinks and the tea bag are so sweet!